Microsoft is launching a new service called Windows 10 IoT Core Services, and it is a paid service. The new service will complement the existing free Windows 10 IoT Core operating system. It is for individuals who want to commercialize secure IoT devices. When IoT Core Services are used in conjunction with the best VPN for Windows 10, there will be a lot of flexibility and opportunities for growth and exploration. By blocking feature updates and only allowing security updates, IoT Core will be transformed into a Long Term Servicing Channel (LTSC). The Device Update Center will also be supported. Hence, the users will be able to customize, create and control updates for devices. Additionally, you will be able to update the OS, the device drivers as well as OEM specific files and applications. Whenever you go online, there is a very real chance that you will leave your digital footprints on the internet. A VPN or Virtual Private Network is a technology, which is famous to bypass this probability. With high speed VPN services, you can route the internet traffic through a network of servers, some of which are in foreign countries. This VPN service enables fortification of defenses against third-party activities when you are online. Le VPN is among the best VPN for Windows 10. You may wonder that a technology that routes internet traffic through a network of servers may slow down the speed of the internet connection. But Le VPN’s best VPN for Windows 10 is far from that. Le VPN comes up with the required technological advances to make your internet browsing experience better and more productive. 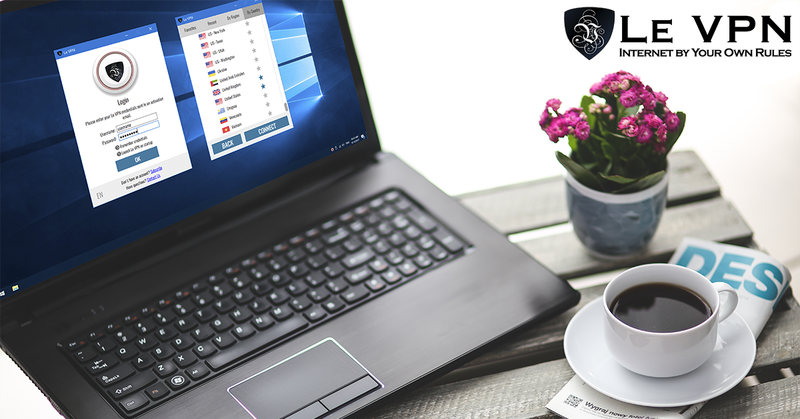 The best VPN for Windows 10 app is available without any additional cost. At the same time, you get better connectivity wherever you go. The user can connect to that VPN server that is closest to him/her geographically, and things will be alright. Best VPN for Windows 10 has the potential to unlock premier content on websites for you. Also, this high-speed connection will ensure that digital footprints disappear into oblivion. And the tracking authorities will never be able to track your online activities. Therefore, the best VPN for Windows 10 makes sure that you do not miss out on any sporting event or news when you are traveling abroad. And governments who want to censor the internet will fail to restrict you. This is possible as they cannot track your IP address precisely. Le VPN’s VPN software for Windows is easy to install. The software is compatible with any Window 10, 8, 7, Vista or XP computer. You can get the detailed information about installation on our webpage. Just subscribe to our all-inclusive plans, and get going. Enjoy unlimited high-speed internet with Le VPN’s high-quality VPN servers and IP addresses in 114 countries. If you have not tried Le VPN for Windows yet, it’s high time to get Le VPN. Subscribe to our 2-year plan for $69.60 only. Window 10 is discovered new online security which is useful for VPN users. There are many devices where it suffers hackling and other bad actors. For this point view, this is good information for them and they can update their software.